A few folks have asked… so… I gave it some thought. 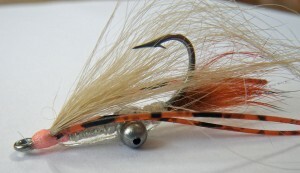 I think this patterns was the one I wish I had more of down there in Andros at FIBFest. Reverse Gotcha... bunny tail... rubber legs... ya know... "stuff"
Maybe this has a name… I’d think it is just a bit too similar to other patterns to have it’s own. It’s goodness. I added some UV Cure whatever to the back of the fly, which is a move I really, really like. Some folks said it would make the fly land too heavy… I didn’t see that, but it is possible that would be an issue in really skinny water. This fly is a #2… so… not little, but after reading some of Aaron Adams’ thoughts on the matter, I think we should probably move up a size or two on most of the flies we throw. 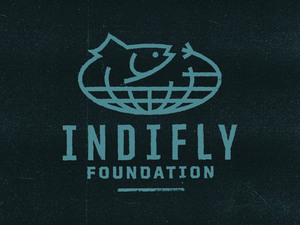 This entry was posted on Sunday, April 10th, 2011 at 1:39 am	and is filed under Flies. You can follow any comments to this entry through the RSS 2.0 feed. You can leave a comment, or trackback from your own site. I did on the water! “The Crazy Bjorn”,” The Bjorn Gotcha” ? Rubber legs. Rubber Legs. RUBBER LEGS!